While she is about to star in the first female-led Marvel movie, Carol Danvers has not always enjoyed such a prominent position in the comics. Created by Roy Thomas and Gene Colan, she made her debut in March 1968’s Marvel Super-Heroes #13 as an air force officer who crosses paths with Mar-Vell, the original Captain Marvel. And while her origin was retconned in the recent Life of Captain Marvel mini-series, which brought her Kree heritage to the fore, Danvers initially seemed to receive her powers after being caught in an explosion, in May 1968’s Captain Marvel #1. Written first by Gerry Conway and then Chris Claremont and drawn by John Buscema, it would be almost a decade before she resurfaced in January 1977’s Ms Marvel #1. Released to coincide with the then-burgeoning feminist movement, campaigning for equal pay was even a part of her day job. Making her bow as Captain Marvel in July 2012’s Avenging Spider-Man #9, Carol was granted her own monthly series the very same month. With a sharp new costume and look by Jamie McKelvie, the version that was established by writer Kelly Sue DeConnick and artist Dexter Soy is still very much the Carol that will shortly be seen on the big screen. 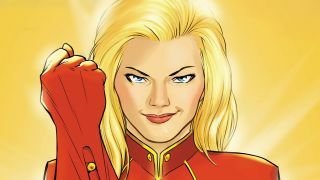 While the movie will elevate Carol to household name status, Brevoort insists that her newfound fame is simply an outgrowth of efforts that Marvel had already made. “Having her image on enormous billboards as the buildup to the film starts to gear up definitely increases the world’s awareness of Captain Marvel,” he says. This feature originally appeared in our sister publication SFX magazine, issue 310. Pick up a copy now or subscribe so you never miss an issue.